The National Union of Journalists is in ‘financial crisis’, a report leaked to Journalism.co.uk reveals. Update 4.52pm: This document has been removed at the request of the NUJ. This entry was posted in Jobs and tagged national union journalists, nuj on May 25, 2012 by Sarah Marshall. The National Union of Journalists is calling on the Scottish government to carry out an inquiry into the effect that editorial cutbacks are having on “a free and diverse media in the country”. The NUJ in Scotland has sought political support for our hard pressed industry for a number of years but the situation has deteriorated to where there is a serious threat to the future of titles but also to the existence of some newspaper groups. We believe there is a duty on government to intervene and help create a safer, robust environment for the press and media to operate. encouraging the development of new sources of funding for investigative journalism, including academic institutions and foundations concerned with civil society and democracy. This entry was posted in Journalism and tagged Journalism, National Union of Journalists, nuj, Scotland, Scottish Government on May 2, 2012 by Paul McNally. 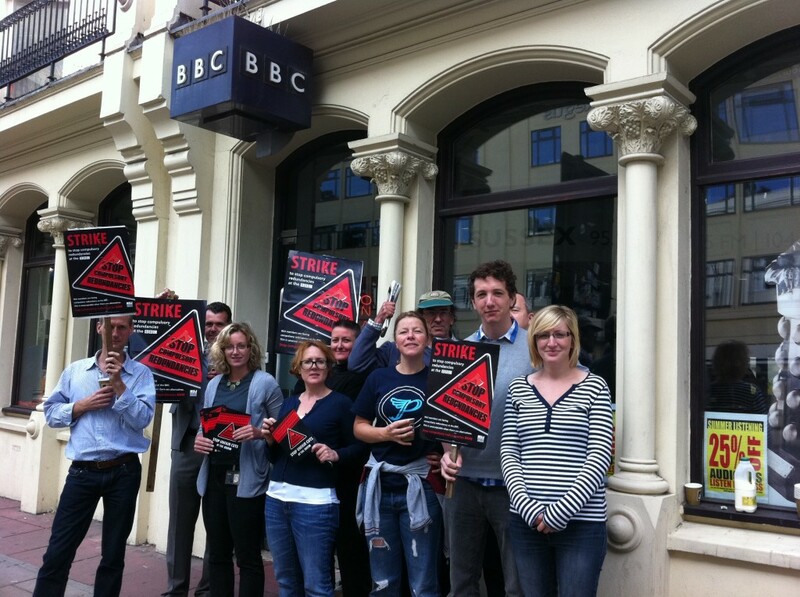 The National Union of Journalists, Bectu and Unite have jointly issued a pay claim for BBC staff for 2012 to 2013, which according to union statements, asks for a rise “of RPI plus two per cent, with a minimum increase of £1,000”. The NUJ says this would apply to BBC staff in bands two to 11. In a statement the NUJ’s broadcasting organiser Sue Harris said they consider it “a fair claim”. According to the unions the claim “also seeks the reinstatement of a previous right for staff to lodge pay appeals” and “encourages BBC management to agree to the inclusion of elected staff representatives on the Executive Remuneration Committee”. Read more on the pay claim on the NUJ and Bectu websites. This entry was posted in Editors' pick, Journalism and tagged BBC, BECTU, nuj, pay, unions, Unite on January 26, 2012 by Rachel Bartlett. 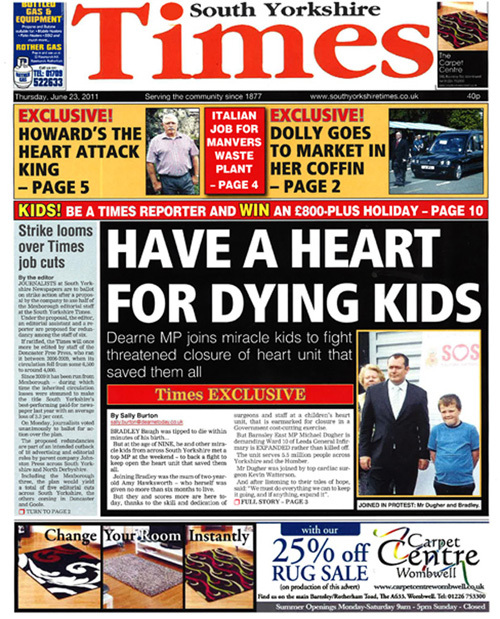 The editor of Johnston Press title the South Yorkshire Times has reported editorial job cuts on its front page, receiving praise from the National Union of Journalists. The NUJ congratulates the editor – whose own job is under threat – for “standing up for quality journalism”. 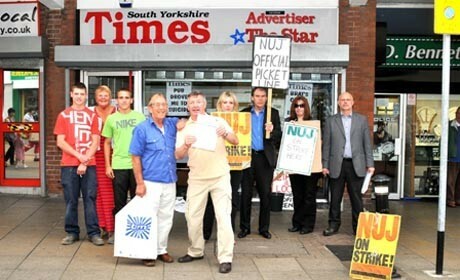 Speaking to the NUJ, Jim Oldfield, South Yorkshire Times editor said: “This is real journalism in action. The Times is currently fighting a brave and protracted battle to keep its core towns from decimation during this recession, I make no apology for acquainting our readers with the changes being proposed for their champion title. 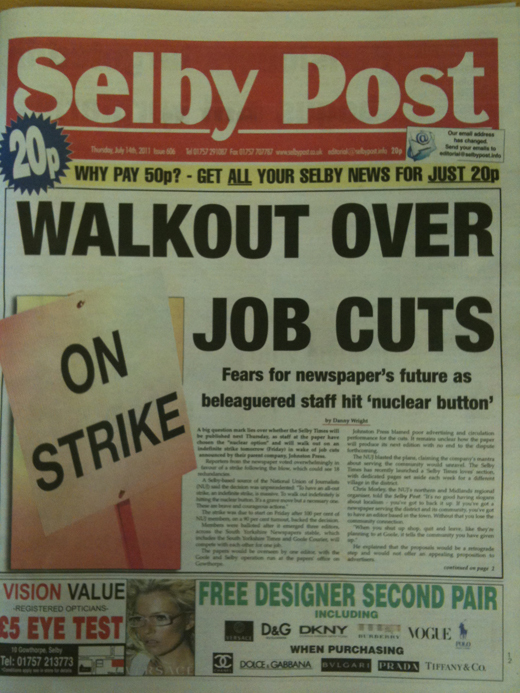 This entry was posted in Job losses, Jobs and tagged industrial action, Johnston Press plc, nuj, South Yorkshire Times on June 23, 2011 by Sarah Marshall.